In my humble opinion, this woman needs no introduction. She (and The Unruffled Podcast partner Sondra Primeaux) are changing the face of what it means to be a sober creative — and that art and recovery are not mutually exclusive, much like Adriana Marchione, our last RePro. I had the pleasure of meeting Tammi at She Recovers in NYC and then again at She Recovers in LA, when I got to take her gratitude art workshop (along with beautiful soul Shelley Richanbach, who led us in a full body gratitude scan). I am inspired by Tammi on a daily basis and my hope is twofold: 1) that I will get to spend some true, quality time with her one day and soak up her art and gratitude and beauty in person, and 2) that you, dear reader, find something in Tammi that resonates with you. It’s my true honor to present Tammi Salas to The Sobriety Collective. Art, writing, podcasting, late bloomer + college student majoring in art at my age! On February 3, 2015, I had my yearly physical scheduled with my general practitioner. January had been filled with a lot of contemplation about how miserable I was in my life. I had a physical bottom with booze the week after Christmas in 2014, so I spent a lot of time examining why I felt the way I did. When I was sitting in my doctor’s waiting room, filling out the general medical intake form, I paused at the question How many alcoholic drinks do you have in a week? I thought about lying, like I usually did on the form, but something inside of me wanted to tell the truth, the whole truth. I put 21 down on the intake form and handed it back to the receptionist before I could change my mind. My doctor seemed surprised by this new information provided, but asked good questions about what I drank (bourbon) and looked up what bourbon was made of (corn) and told me all of that corn was turning to sugar and most likely contributing to a lot of my health issues (cystic acne, weight gain, etc.). She nonchalantly asked me if I would consider going on an elimination diet and removing alcohol first. Now, I love a challenge, so I immediately said yes. She reiterated that I would need to eliminate alcohol for 8 weeks and was I sure that I could do that. The bait was taken and I was all in to eliminate alcohol, gluten, sugar and dairy. The funny thing is that even though I thought I was telling the truth on that medical intake form, it wasn’t the whole truth. In actuality and with hindsight, I was really drinking 42 drinks a week because I drank three double manhattans every single night towards the end of my drinking. I feel like it’s important to tell you this because when I was drinking the truth was fluid and bendable. Once I got sober, I realized I had a long way to go in the truth-telling department. This would be my first start. In sobriety, I started sharing my creative work on Instagram. I was approached to create illustrations for Holly of Hip Sobriety and we collaborated on The Mantra Project: 40 Days of Sobriety email course. I pitched myself to write a column for the Recovery Revolution about how I navigated the 12 steps of AA and it’s called Crossing The Room. I got a little braver with each project. Last year I launched The Unruffled Podcast with my co-host, Sondra Primeaux, and we talk about where art and creativity intersect with our sobriety and recovery from alcohol. I also released a softcover book called My Daily Gratitude Practice: How I Got Started + Found My Visual Voice. I also sell original paintings from my 2018 gallery show called The Geographic. Those can be found in my shop on my website. You probably don't know that you already know this lady's gorgeous face as Instagram's own, @soberinadrunkworld (read through the end for links to Ali's work). I'm - very unabashedly, I might add - one of her biggest fans. Let's put something into context though - when I first reached out to Ali to ask her to be involved, she was super gung-ho with her YES! but hadn't yet made the decision to share her name publicly. Since then, she's asked me to GO FOR IT and her style continues to progress and advance - she's come up with lots of delicious art that I'll be sharing, naturally. Lastly, I'll just thank this sweet soul for her patience as my editorial schedule is non-existent and really depends on my mood - and because the latter half of 2017 was truly a tumultuous time in my life, I suppose it's apropos that I post this on the first day of a new month in 2018. That being said, on to the goods! I can't remember when I started to rely on alcohol for confidence and to get me through social stuff - probably pretty young. I drank heavily every weekend through my twenties and thirties but everyone did so it was just normal to me. I always drank more than everyone else though and I was always the instigator of heavy drinking nights. Gradually the weekend drinking spread into the rest of the week. I began to worry about it and felt uncomfortable around people that drank "normally". I knew I needed to address it long before I did anything though but eventually I was just so tired of how it made me feel I couldn't do it any more. I started trying to stop in May of 2016 and had longer and longer periods of sobriety ;then I did Hip Sobriety School with Holly Whitaker in Spring of 2017 and that was absolutely pivotal for me. Almost as soon as I got sober I started drawing, I think I'm trying to make up for all the years spent numbing out my creativity! 1. Breathing - I use meditation and deep breathing exercises to calm me in times of need! 2. Music - I love music to change my mood in the direction I need to go, sometimes some upbeat pop, sometimes calming classical or maybe some chilled out jazz! 3. Connection with the recovery tribe on line - they bring me back to reality when my mind goes crazy! 4. Lavender oil - love it! 5. I will just pick up a pen and paper and sketch and doodle, I find it the best way to focus my mind I guess its a form of meditation for me. If you look closely at the clouds, you might see a familiar face, wearing the #OCD spark bracelet. Super excited to bring you our latest RePro by none other than Ms. Vero Higareda of Spark Bracelets. 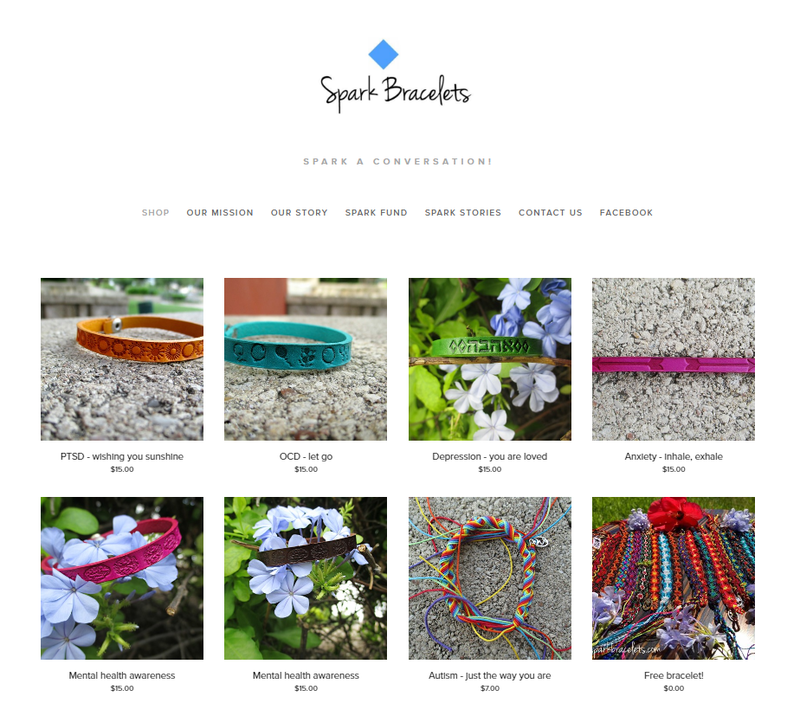 This young lady (editor's note: wow, I feel old) is changing hearts and minds and challenging us all to #sparkaconversation about mental health through her beautifully designed bracelets. 10% of every sale goes to her Spark Fund--read more about that drop of golden philanthropy here. Thank you, Vero, for showing us that mental illness is not a life sentence--in many ways, it's a gift. cannot tell you how reading saved my life so many times. At times when I felt that there was noo hope for me, I would find online forums and spaces (just like this one!) and would read other people's stories. It would give me sooo much encouragement because I thought, hey! there is someone out there, right now, who feels just like me. I am not alone. And if they have been able to recover and live well, then so can I! I also started reading a lot of textbooks that talked about OCD, mental illness, addiction, etcetera. I feel that reading and learning more about these subjects helps you give it meaning, and understand that there are things beyond your control but then there are also things which you can do to help yourself. It's also a good distraction, and you learn while you’re at it! I think this is one of the hardest things to do but once you start getting the hang of it a lil bit, it only gets easier from there. It's hard to love oneself, we are always criticizing ourselves, what we do, what we think, we compare ourselves to others... but once we start shutting off these voices, things start to change internally. When we hear inside our heads "you're ugly" or "you're dumb" and we respond NO, I AM NOT. I think this is where we start self-love. We need to constantly remind ourselves that we are beautiful, that we are loved, that we are meaningful. And if we learn to love ourselves, things start getting brighter and better. To be completely honest, I have NEVER been a fan of exercising. But somehow running clears my mind off. Although, when I get my relapses of OCD, there is never really a time where I have a clear mind, running helps me distract myself even if it's just for seconds. It's also good for your physical health, so there we go, right!? Ahhhhh, if there has been something that has helped me it has been therapy. There is a looot of stigma involving therapy; if you tell someone that you are seeing a psychiatrist you immediately get this, are you crazy? look. THERE IS NOTHING WRONG WITH GOING TO THERAPY. Honestly, I think everyone should do it. I know therapy can be expensive, there have been moments in my life where I haven't been able to afford it. If you can't afford it then please talk to someone you love and that you know that will actually listen to you, and not judge you. Talking always helps. Keeping a journal has helped me keep track of my thoughts and my emotions. How they have changed, how much progress (or lack of) there has been. It increases your self-awareness and it is nice to have your thoughts laid out, and in a journal you can express how you feel without fear of being judged. You’re also able to track your personal patterns of behavior that help you achieve goals and respond effectively to challenges. Connect with Vero & Spark Bracelets.